Pharaoh: King of Ancient Egypt introduces viewers to the men (and women) who ruled Egypt over three millennia. Opening on March 13, the exhibition presents a varied selection of 145 objects—including monumental reliefs, stone sculpture, faience ornaments, splendid jewelry, and historic papyri—from the vast holdings of the British Museum, along with a number of masterworks from Cleveland’s own collection. With nearly 100,000 objects, the British Museum’s Egyptian collection is one of the largest in the world. Originally developed by that institution’s Department of Ancient Egypt and Sudan, Pharaoh is based on the simple but dynamic idea that “things are not what they seem” when one looks at ancient Egypt and its rulers. On one side are our preconceived ideas about ancient Egypt, and the pharaohs’ depictions of themselves in written sources and images (let’s call it the official discourse), and on the other side are the realities of power. Organized in ten sections, the exhibition first addresses the myths and traditions surrounding kingship and the pharaoh’s relationships with the many gods of Egypt; then the reality and history of palace life and the royal family, governance of the country, and the relations between Egypt and its neighbors; and finally royal tombs and the afterlife. Beyond exploring the myths and realities of power in Egypt, this exhibition also offers the opportunity to question Western views of Egyptian art through the representations of kings and kingship. Ancient Egyptian images were seen as “substitutes,” magically efficient and alive. Thus, in most cases, a royal image stands in for the king and for his duties, chief among which is maintaining cosmic order, or Maat, mainly by ensuring Egypt’s territorial integrity and satisfying the gods. In this regard, one of the masterpieces of the exhibition is the seated statue of Seti II, a grandson of Pharaoh Ramses II who ruled at the end of Dynasty 19 (c. 1200–1194 BC). 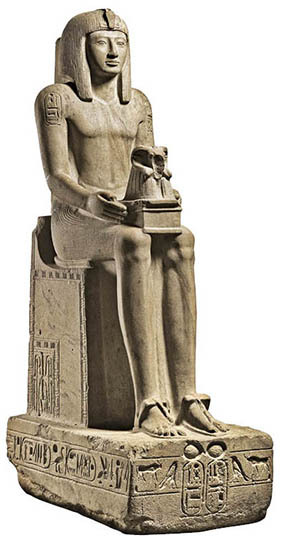 This statue represents the epitome of royal Egyptian imagery and its functions. First, several elements indicate the sitter’s royal status: his throne and birth names (enclosed in a cartouche and engraved on his shoulders and on the base), the rearing cobra on his forehead, and the animal tail hanging between his legs. Then, his peculiar pose in which he holds a ram’s head (the emblem of Amun-Ra) on a pedestal specifies the statue’s function. It is meant as an offering to Amun-Ra, at once a dynastic and a solar god, whose main temple was located at Karnak in Thebes (modern Luxor). Although Seti II reigned during a period of confusion and political crisis, his statue conveys the impression that he still managed to please the gods. This beautiful example of Ramesside sculpture was a favorite of Henry Salt, a British consul whose collection it entered after its 1816 discovery at Karnak, presumably in the precinct of Mut temple. Its elegant features and quality workmanship may have helped to persuade the trustees of the British Museum to acquire Salt’s Egyptian collection three years later. On a completely different scale, a small gold winged scarab ornament addresses the fundamental relationship between text and image in ancient Egyptian art. Such art can be considered “hieroglyphic,” as it is the simultaneous expression of writing and image. 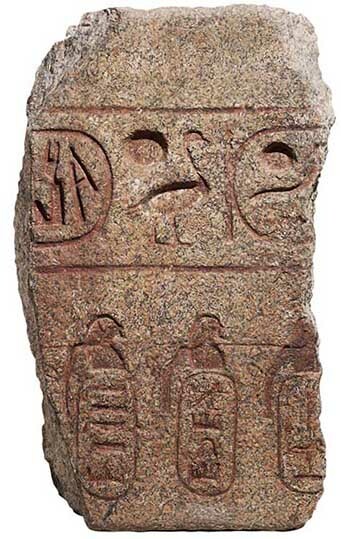 A hieroglyphic sign, or a group of hieroglyphic signs, can function as a representation. Conversely, elements of a representation can be interpreted as written symbols. 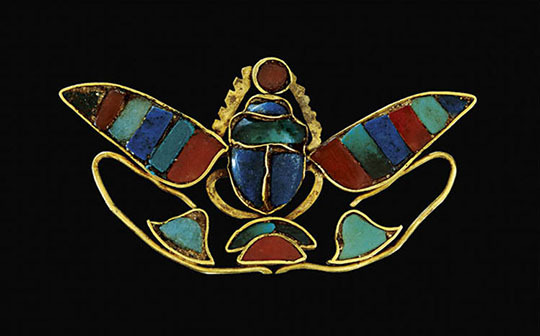 Thus, in this exquisite jewel inlaid with lapis lazuli, feldspar, electrum, and carnelian, one can read the throne name of Pharaoh Senusret II—Khakheperra, or “Appearing is the Manifestation of Ra”—through the combination of three signs (from bottom to top): a hill (kha), a scarab (kheper), and a sun disk (ra). Pharaoh’s effigies were meant to be powerful in every sense of the word, both as functioning images and as images of power. These magical and ideological aspects come to life on the base of a statue of Ramses II. The king’s feet are shown walking over nine bows. The bow itself probably refers to the deserts bordering the Nile valley, places often associated with disorder and everything foreign. Three is the mark of plural in ancient Egypt—the tripling of three here meaning “plurality of pluralities”—so the nine bows allude to all of Egypt’s possible enemies. This allegory’s role is to permanently repel chaos by literally stepping over Egypt’s traditional enemies (whose identity varied over time: Libyans, Nubians, people from Syria-Palestine, then Persians, Assyrians, Sea People, and others), hence their usual position on royal statue bases, on steps and balustrades, and on footstools. Captured enemies, with their arms tied behind their backs, were also depicted on temple walls for the same purpose, sometimes with reference to actual foreign neighbors under Egyptian control, as on a red granite slab from the Bastet temple at Bubastis (Tell Basta). This temple relief is inscribed with the royal titulary of Ramses II above the names of his enemies, placed in rings or cartouches and topped by figures with hands behind their backs and linked together at the neck. However, this graphic interplay better illustrates Egypt’s worldview than it does the actual geopolitical reality of the times. Whatever their real reception, images and architectural achievements enhanced the assertion of the pharaoh’s policy and authority on Egypt’s territory and even beyond, while being part of the broader ideological discourse on monarchy in Egypt. The examples shown here testify how art, religion, and power were closely intertwined in ancient Egypt; they also underline the different levels of interpretation about ancient Egyptian art and architecture that visitors will discover in Pharaoh: King of Ancient Egypt.